To get the full meaning and context, it is best to start reading from John 7:1 through John 8:11, but in a synopsis, we learn that Jesus leaves for the seven-day Harvest Festival2 after his brothers had already left. “Then, midway through the festival, Jesus went up to the Temple and began to teach.” (John 7:14, NLT). The next day Jesus came back to the temple and he began to teach again. It was at this time, that the event with the accused adulteress happens. The woman was used as a pawn. Concerning adultery, God’s law required that both the man and the woman must be brought to the temple and accused. Now, in this event with Jesus, the teachers and the Pharisees neither brought the man involved, nor did they bring any witnesses, unless the accusers were the witnesses themselves. In that case, they would have to testify individually, but they did not. So either way, they ignored the law. 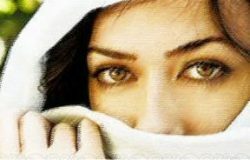 “The woman is simply a pawn for the Jewish leaders who wish to play off Jesus’ well-known compassion for sinners…[see: Luke 7:36–50] against the demands of the law. 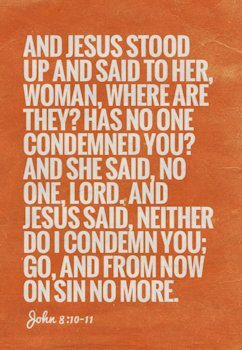 However Jesus does not deny the woman’s sin but he draws her accusers into the circle of condemnation.”3 “The purpose of bringing this woman before Jesus was to discredit Him as a Teacher. If He condemned her, he would lose favor with the common people. If He did not, he would be disagreeing with Moses.”4 The teachers and the Pharisees came to challenge Jesus, but Jesus turned their tactical maneuver around and challenged them by stating that the one without sin should throw the first stone. I’ll give you my own idea, although it is not unique, for several researchers had reached the same conclusion long before me. But first, let me add a bit of additional information. Jewish history shows that there was a certain ceremony that would be done in order to bring judgement to those accused of a crime. The priest was required to stoop down and write the law that had been broken along with the names of the accused, in the dust on the floor.10 Being written only in the dust, the marks would not be a permanent public record. Considering this, and the fact that Jesus spoke of the Jeremiah prophecy the previous day (see quote of Jeremiah 17:13 above), I believe that the first time he stooped down, he wrote a notation for that scripture. When the accusers again demanded an answer, he said the one without sin should throw the first stone. Then stooping the second time, he also wrote their names in the dust, because they had all turned away and forsaken God with their own sins. The men had an opportunity to receive forgiveness, just as the woman would receive, but instead of repenting at this second request, they walked away. That passage in Jeremiah was a Messianic prophecy and we see that Jesus fulfilled it at that very moment.11 In this instance, Jesus’ message was that he was sent by God to bring salvation, not condemnation, but the accusing priests didn’t understand this. “They had forsaken the message of the Feast. They had just seen the promised Fountain of Living Waters standing before them, yet they were more interested in seeing that the law was kept to the letter.”12 Jesus effectively turned the focus of breaking the law of Moses away from the adulteress and placed it upon the Jewish teachers and enforcers of the law. That she should now be stoned. He scribbled in the sand. And Jesus and the women found that they were all alone. 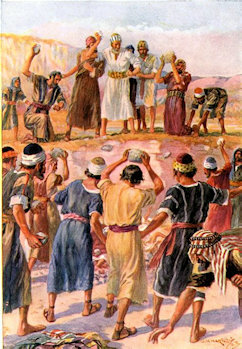 Stoning was cruel, but there was an important reason for it. Lacking an assigned judicial executioner, a group of people was necessary to take the life of the guilty party. And “since in the aftermath of a hail of stones, who can say which was first and which was last . . . the unanimity of the group’s action ultimately confers anonymity on each individual . . . .”14 This is similar to the later historical use of a “firing squad” after the invention of firearms. All members of the squad were instructed to fire simultaneously, preventing identification of who shot first. Many times, one or more rifles had a blank cartridge, so it was unknown exactly who even fired a fatal shot. 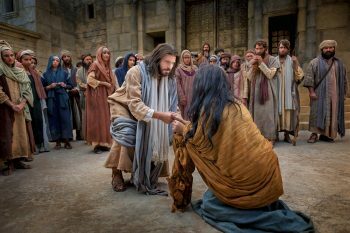 Who was the accused woman brought to Jesus? Well, we don’t really know, for the Bible does not give that detail, but it has been the subject of much analytical discourse. 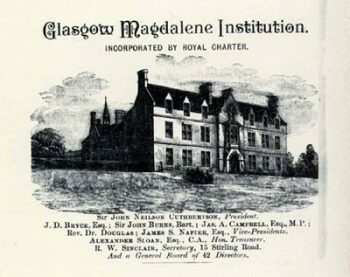 The name Mary Magdalene is sometimes brought up as a possibility and, for some time in the early church, it was believed to be so. They also believed that the incident in the temple had inspired her discipleship with Jesus. Although most scholars do not believe it was Mary of Magdala, there are some few who still do. Holy Bible, New Living Translation (NLT), ©2007 by Tyndale House Foundation. Used by permission of Tyndale House Publishers, Inc., Carol Stream, Illinois 60188. Harvest Festival, also known as Festival of Booths or Feast of Tabernacles. During the existence of the Jerusalem Temple, it was one of the Three Pilgrimage Festivals. Burge, Gary M., Evangelical Commentary on the Bible, Baker Reference Library (Grand Rapids, MI: Baker Book House, 1995), vol. 3, p. 859. Blum, Edwin A., The Bible Knowledge Commentary: An Exposition of the Scriptures, Walvoord and Zuck, (ed. ), (Wheaton, IL: Victor Books, 1985), vol. 2, p. 347. Tourville, Robert E., The New Testament Study Bible, The Complete Biblical Library, Ralph W. Harris (ed. ), (Springfield, MO: World Library Press, 1986), vol. 5 (John), p. 223. Are you implying that the prostitute in the temple is Mary Magdalene? No! Over the years, many people have questioned me about that possibility, so I added those two paragraphs at the end of the article, as additional information, for those that may have an interest. There are reasons to speculate that the two women are the same, however I believe there is more evidence against that possibility, than for it. 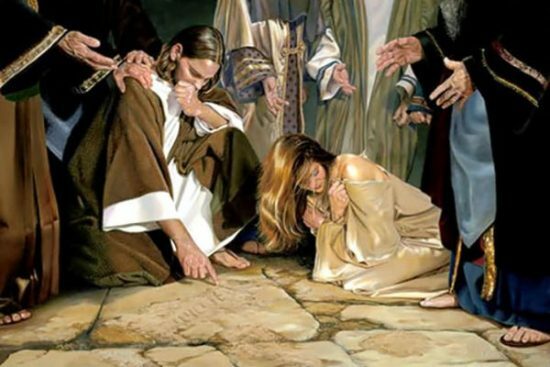 I have been studying this subject for some time and will publish an article in the future about Mary Magdalene, but currently I do not think the adulteress mentioned in John 8:1-11 was her, contrary to what the Roman Catholic Church taught for hundreds of years. I should mention that in the late 1960s, they amended their line of reasoning about this relationship. Thank you reading this article and taking the time to comment. It is appreciated.